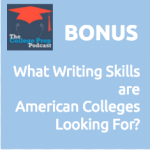 037: What Writing Skills are American Colleges Looking For? The 5 paragraph essay is a style of writing that is commonly taught in American high schools. What is it, and how can you learn how to write a strong essay in preparation for college? Tune in as Megan and Gretchen break it down for you in under 10 minutes.